Kids Next Door, Battle Stations! Let Your Imagination Go Wild! Create your OWN Kids Next Door Character! 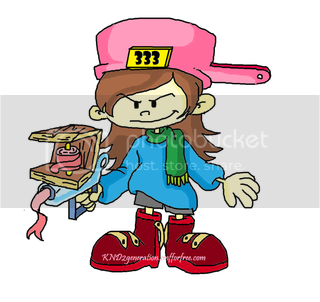 I, Numbuh 333, now accept requests in creating your own desired KND character! 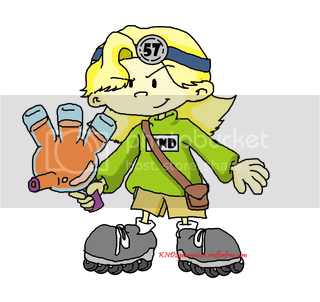 It's like... it's the KND version of yourself in our RP site. I make characters in MS Paint, and I'm not that good yet... But I'll try my best. Follow the form below via copy & paste. Accessories (anything your character would have in his/her hand or wherever): A 2x4 technology, R.I.B.B.O.N. It shoots ribbons. Up to you what it looks like. Add-ons (anything you would like to add? ): I want some sort of "cool" expression. *Requests will not be considered via PM or if you don't follow the code above. "Even when I'm already an adult, I will still be a kid at heart." Numbuh 57 Reporting for Duty! Accessories: a Doctor's Parabolic Reflector with a *57* in it. Add-ons (anything you would like to add? ): A 2x4 Technology Weapon, a squirter Orange Juice Gun and a Shoulder Bag that is also a 2x4 Tech Weapon that can Hold all the Gadgets Needed.